Located in south central Maryland along the banks of the Potomac River, beautiful Charles County is home to approximately 147,000 people. Considered part of the Washington Metropolitan Area, the county continues to experience solid residential and economic growth. Known as the “Shopping Capital of Southern Maryland,” Charles County is home to a variety of shopping destinations, including the 1.1 million sq. ft. St. Charles Town Center, which features nationwide favorites such as Macy’s, JC Penney, Kohl’s, Sears, and more. Unique boutique shops and antique stores can be found throughout the county’s towns and communities, including at The Market, the one-stop shopping destination that features the products and services of 40 area entrepreneurs. Locals also enjoy purchasing the beautiful, handcrafted furniture made and sold by the county’s Amish community. For beautiful, waterfront dining in Charles County, visit the Port Tobacco Marina & Restaurant. Or, check out the authentic, Jamaican dishes served up by Caribbean Flava in Waldorf. Charles County, Maryland offers residents a host of options for indoor and outdoor fun, no matter the season. Numerous nature trails provide plenty of opportunities for waterfront hiking, horseback riding, jogging, bicycling, and observing wildlife, and new facilities are being built seemingly all the time. Maxwell Hall Park, the county’s newest equestrian facility, offers 14 miles of horse trails, beachfront riding, an obstacle course, and a jumping course. And, the new Indian Head Rail Trail features a 13-mile bike trail through some of the county’s most beautiful and undeveloped areas. The Capital Clubhouse, located in Waldorf, is one of the premier recreation facilities on the East Coast. The 90,000 sq. ft. Clubhouse features an NHL-size ice rink, a rock wall, two multi-sport courts, an arcade, a world gym, and Jazzercise classes. Best of all, it’s open year-round and even hosts a variety of kids’ summer camps. The county is also home to one professional baseball team, the Southern Maryland Blue Crabs. Tickets are available for home games at the Regency Furniture Stadium in Waldorf. Charles County real estate has something for everyone. Whether you’re looking for a single-family home in a residential suburb or a farmer’s life in the rural country to the south, you’re sure to love living in Charles County. Surrounded by water on three sides, water activities, such as kayaking, swimming, and fishing, are favorite local pastimes. 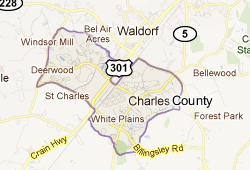 About half of the county’s residents live in the unincorporated community of Waldorf, Maryland. Many residents also live in the county’s three incorporated towns: Indian Head, La Plata, and Port Tobacco Village. Median home values were approximately $352,000 in 2009. One of the fastest growing school districts in Maryland, Charles County Public Schools provides high-quality education to approximately 27,000 students. In addition to the 21 elementary schools, eight middle schools, and six high schools currently operated in the county, a new high school, St. Charles High School, is scheduled to open in August 2013. The county’s university, The College of Southern Maryland, is located in La Plata. Many of the area’s residents make the easy commute into Alexandria, VA or Washington D.C. on a daily basis.